In the past decades, China has been the center of all attentions, rising from a third world country to being the second largest economy in the world. While it eased access to its vast domestic market, it also emerged as the world’s factory floor, becoming a world class location to produce and source a wide range of products. Arising as a global economic powerhouse, China is now going on a shopping spree, buying companies and increasing cooperation with economies all around the world to capture opportunities that globalization stands to offer. In this context, Africa has become a top priority in China’s agenda as it’s shifting from years of poverty and political turmoil towards economic development and relative stability. Moving away from offering unconditional assistance to seeking strategic partnership, China became one of Africa’s leading business partners. Sino-African modern relations started in 1955 after the first Asia-Africa Conference, the Bandung Conference, and were marked by the establishment of diplomatic relations between China and Egypt on 1956. At the very beginning, ties grew based on foreign aid and ideological solidarity but quickly evolved, in parallel with China’s push for development and openness. A phase of policy readjustment resulted in a shift from politics to economy and sustainable cooperation with China being today Africa’s biggest trading partner, heading over USD300bn by 2015. The latest records show that 4700 items exported from Africa enjoy zero-tariff treatment and 45 bilateral trade agreements have been signed with African countries. In contrast to trade, Chinese direct investment in Africa remains relatively limited, reaching a total of 14.7 $bn in 2012. Nonetheless, it has registered impressive growth in recent years, increasing by 46% from its level in 2003 ($490 million). 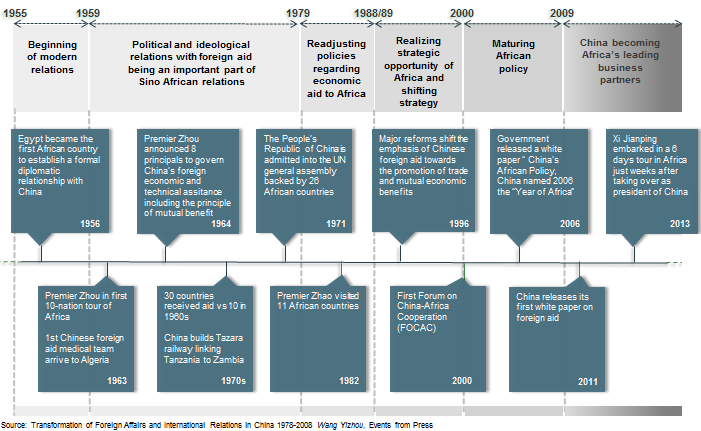 Navigate through Modern Sino-African History with this timeline retracing main events that shaped today’s relation between both partners. Imane FAHLI, Senior Analyst, Infomineo.